The best, secure, reliable, scalable and affordable cloud hosting of Pakistan. All of our servers are branded and loaded with SSD hard drives which provide faster data read and write speed. Now install 100's of scripts free with just on click. No manual uploading or configurations required. No worries our team will move your data or website from your old provider with care at no additional cost. We are connected with world leading data centers and networks which enables faster access to our network. Pay annual subscription and get Free SSL for your website. We have experienced, friendly support staff available for your help 24/7. If you will not be happy with our services no worries you can get your money back within 30 days of your first purchase. All of our services are hosted on latest branded servers with IPv6 compatible network. Manage your cloud hosting account with easiest control panel. cPanel is the most widely used and easiest hosting control panel, that is why all of our cloud hosting plans come with cPanel for account management. With cPanel you can manage your website files, folders, and databases, create email accounts, manage domains and subdomains and a lot more. 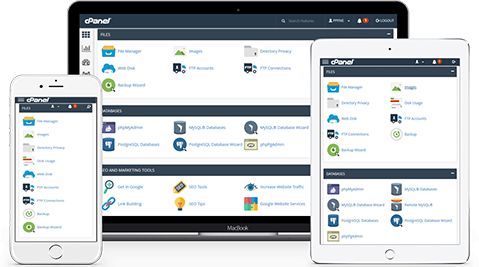 To make cPanel even more friendly, we have customized its skin and organized the tools in a friendly way. We have also added plenty of third-party tools to give you more control over the account.